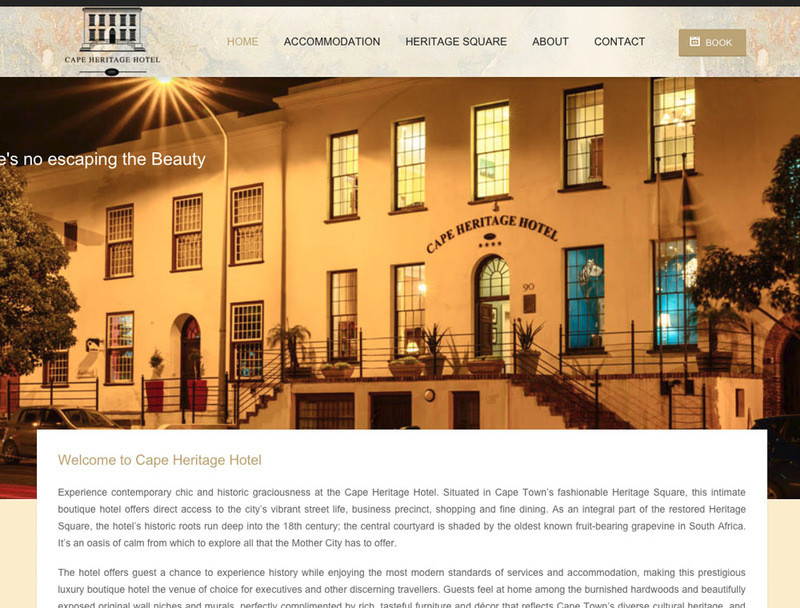 Experience contemporary chic and historic graciousness at the Cape Heritage Hotel. 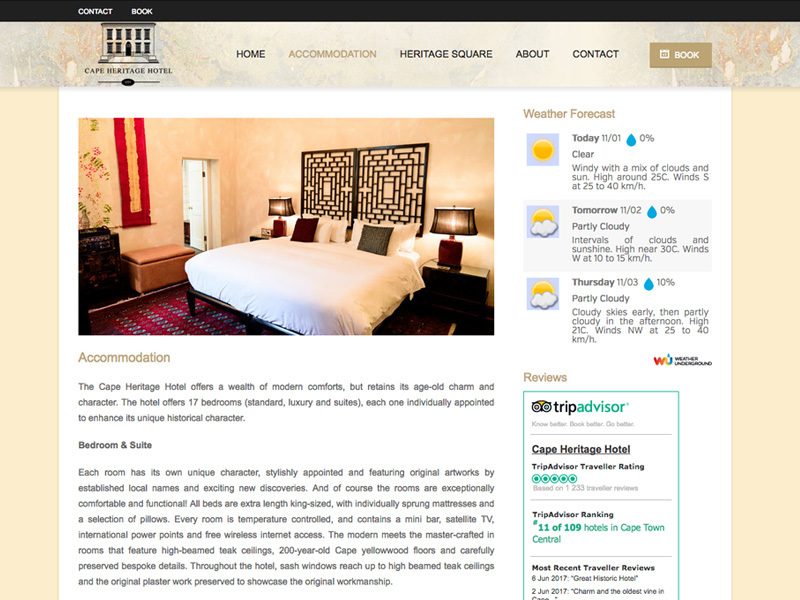 Situated in Cape Town’s fashionable Heritage Square, this intimate boutique hotel offers direct access to the city’s vibrant street life, business precinct, shopping and fine dining. As an integral part of the restored Heritage Square, the hotel’s historic roots run deep into the 18th century; the central courtyard is shaded by the oldest known fruit-bearing grapevine in South Africa. It’s an oasis of calm from which to explore all that the Mother City has to offer. The hotel offers guest a chance to experience history while enjoying the most modern standards of services and accommodation, making this prestigious luxury boutique hotel the venue of choice for executives and other discerning travellers. Guests feel at home among the burnished hardwoods and beautifully exposed original wall niches and murals, perfectly complimented by rich, tasteful furniture and décor that reflects Cape Town’s diverse cultural heritage, and radiates the energy of its current cutting edge. 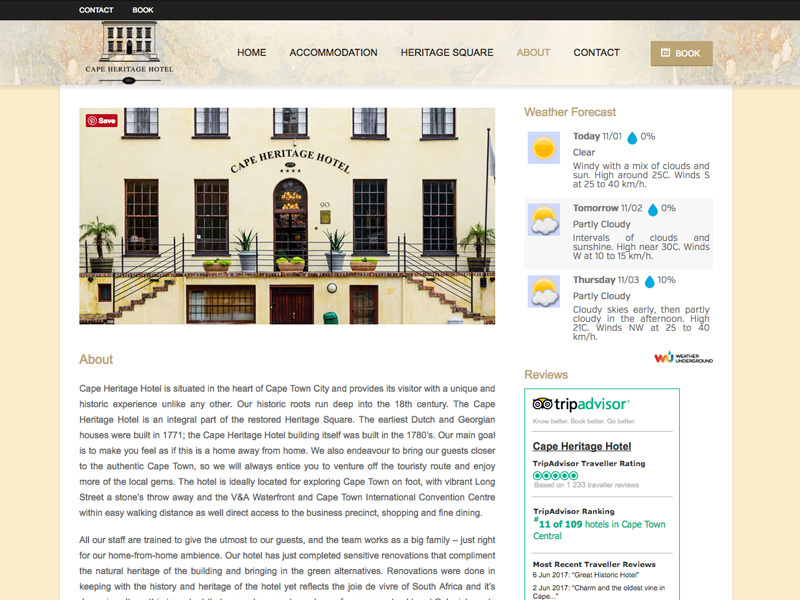 The hotel has fifteen bedrooms and two suites, each one individually appointed to enhance its unique historical character. High style meets deep comfort, and the modern meets the master-crafted, in rooms that feature high-beamed teak ceilings, yellowwood floors and carefully preserved bespoke details – as well as air-conditioning, mini bar, king-sized beds, satellite TV and international power points.